Follow in the footsteps of Charles Darwin and explore the wonders of the Galapagos Islands. Travelers often enjoy combining their Galapagos cruise with an island lodge stay in order to extend their vacation. As Galapagos experts, we work closely with only trusted and experienced lodges that can seamlessly combine with cruises. From the highlands of Isabela Island to the centrally located, Santa Cruz, we have a lodge option for every traveler. 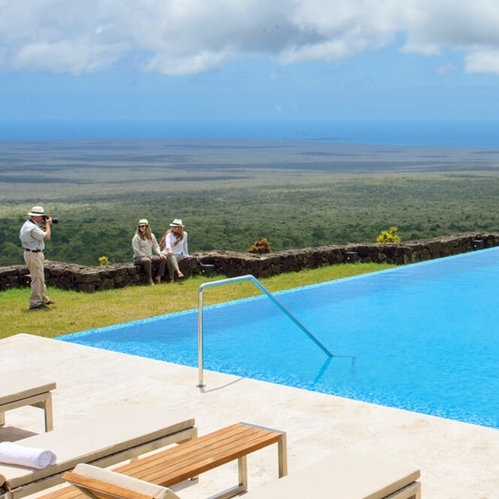 Below you will find a selection of our top-selling Galapagos lodges used for island hopping. This lodge is located on top of two extinct volcano craters and is surrounded by 31 hectares of lush green forest and savannah. Guests at the lodge can look out over much of the island and are treated to unrivalled ocean views. The Pikaia Lodges is knows as the most luxurious lodge on the islands. Located on one of Isabela Island’s volcanoes, guests sleep in luxurious 570 square foot tents that are equipped with plush double beds and en-suite bathrooms. The lodge arranges all Galapagos Islands excursions and activities including snorkelling, visit to the Giant Tortoise Breeding Center, trekking and more. The Galapagos Safari Camp consists of a number of lavish tents "safari style", equipped with plush beds and modern facilities. The tents allow guests to feel fully immersed in nature without having to compromise their comfort. Select from a Standard Safari Tour, Family Safari Tour or Scuba Diving Tour. But what if I want to visit somewhere else? If you want to visit anywhere else in South America, don't worry at all - we've got you covered. With our extensive knowledge of travel within the region, we have the contacts and know-how to put together an itinerary just for you, all you have to do is ask! Give us a call and one of our Travel Specialists will be happy to answer any questions. The main selling point of the Galapagos Safari Camp is its range of services to help you design the perfect Galapagos trip. 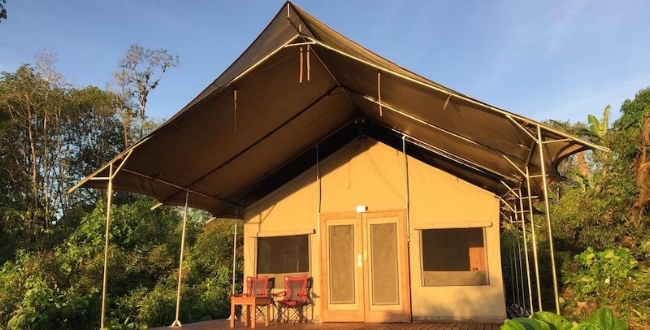 The Classic Safari option that the camp offers includes spotting giant tortoises; visiting some of the nearby islands; and hiking around the eastern side of Santa Cruz Island. The Red Mangrove Hotel provides a very high level of eco-luxury to its guests. This means it has adopted a number of sustainable and environmentally-friendly practices without making its guests sacrifice any of their luxury. Please note we do not sell flights directly ourselves, but we do work with our trusted South American flight specialist partner Exito Travel to create seamless itineraries. All lodges can be be easily combined with a cruise or land tour.